Masters of medieval metal, the mighty GWAR, are poised to return to the world of man as today they announced the first leg of their massive “Madness at the Core of Time” world tour, in support of their new album, Battle Maximus, which is out September 17th on Metal Blade Records. The tour features a completely brand-new show full of slavering creatures and deserving victims. Tickets go on sale this Friday, August 2nd. Of course Oderus had more to say (when doesn’t he?). Battle Maximus is GWAR‘s 13th studio album, and their first since legendary Scumdog Flattus Maximus returned to the stars to fulfill his cosmic destiny. Check out the first track, Madness at the Core of Time on The Welding Room and pre-order your copy of Battle Maximus HERE. 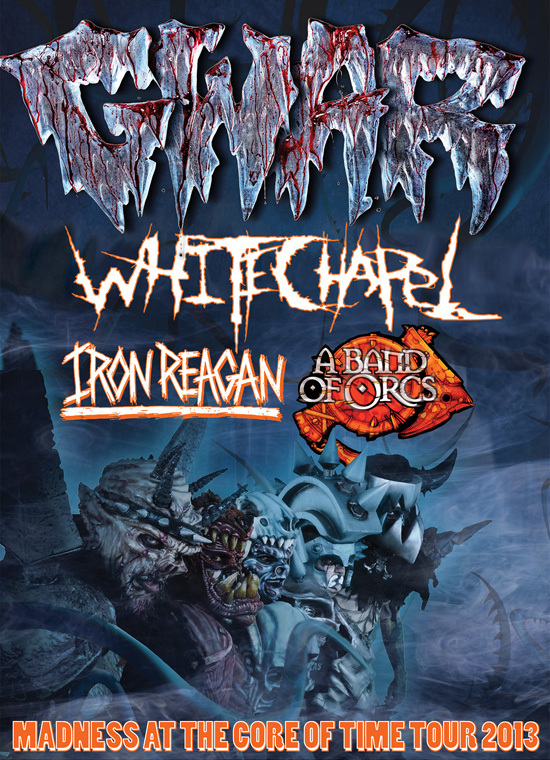 This entry was posted in METAL and tagged A Band of Orcs, Battle Maximus, Entertainment, Flattus Maximus, Gwar, GWAR-B-Q, Iron Reagan, Metal Blade Records, Montreal, Municipal Waste, Oderus Urungus, oscars, transportation, WhiteChapel. Bookmark the permalink.